Ahh a cup of tea! Tea has been an important part of many cultures throughout history. Maybe it's a bracing cuppa in England, or solemn Japanese tea ceremony, or even a special time with friends in one's home. 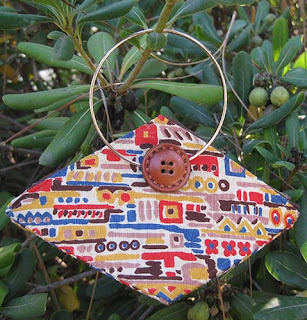 Regardless of where you are, drinking hot tea can look different depending on where you are in the world, but when drinking hot tea, a teapot of some sort is common amongst all cultures. Keeping that tea warm is important as well which brings us to today's post! Remember those advertisements on matchbooks or in the backs of old comic books promising that if you could draw Tippy the Turtle you could win a scholarship and become a famous artist? I always wondered about those, so when I found this set of four huge canvas covered binders for three dollars, they were definitely coming home with me. It turns out that Tippy was advertising for Art Instruction Schools and my set is from the Famous Artists Painting Course. 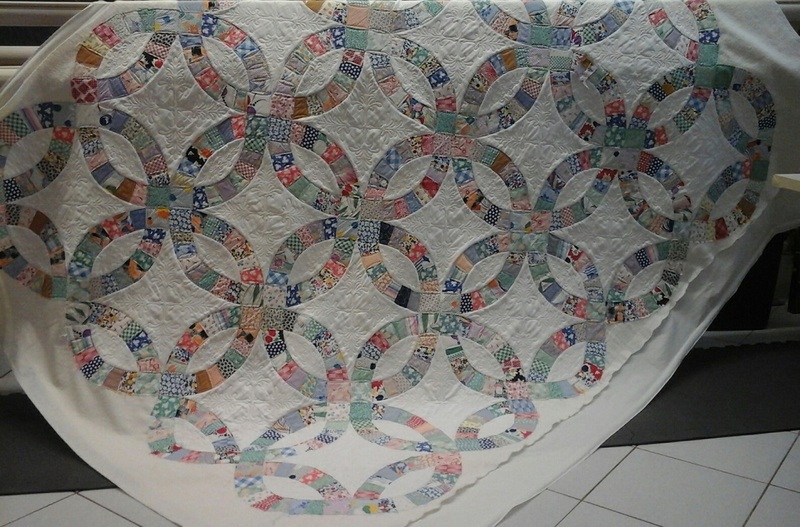 As Teri mentioned last week, we had a great time down in Williamsburg, Virginia, at the Academy of Appliqué. Not only did we teach, but we were able to take a little time beforehand to go to the Mid-Atlantic Quilt Festival in Hampton, Virginia. It's a great show with various exhibits and some stunning quilts. 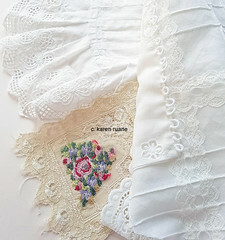 If you have been reading the blog for a while now, you will know Teri and I have a great love for all things vintage—especially linens, clothing, or lace. Teri recently shared her story about a special dress in A Vintage Pinafore, Tea, and Friends, and I shared the story of my apron collection in Apron Strings. We even wrote a post together about our quest for vintage treasures in a Hershey, Pennsylvania, antique mall in Vintage Treasures Newly Acquired. We love seeing the handiwork of those who have stitched before us! 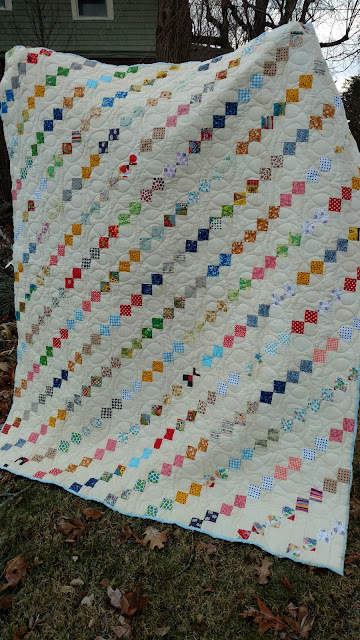 You might remember this quilt, that I posted in 2014. It was made in 1948 by my great grandmother, Rose Brown Tague. The traditional honey bee block, in pink and purple, alternates with snowball blocks with green corners. The original post can be accessed under “Family Antiques” in the right-hand column. I recently found an old photo, taken of my grandmother, Mary Josephine Hamrick Tague, holding nine-day-old me, her first grandchild. Covering her chair is this new quilt, positively dating it to 1948. That’s my father’s writing; he probably took the photo. One of her finds,an antique frame with an intriguing rattle under the backing paper, got me thinking about this print and its frame and wondering if maybe it had a fancy name. Google did not answer my questions but, according to Lori, it's an Art Nouveau Pie Crust frame. 1. Deconstruct garments for a memory quilt. Done! They are now a pile of flat pieces just waiting to be pressed and cut up into quilt pieces! 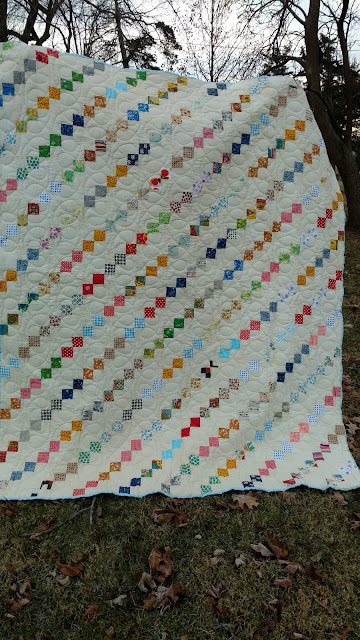 I finished the binding on this old quilt. It's a rescue. I found it at a flea market for 12.50. The top had been hand sewn and the fabrics were vintage. Someone had taken it, and longarmed it. And, when I rescued it, it only needed trimmed and a binding. It had big fluffy batting. There was enough of the back to use as the binding. I trimmed it, and folded it, and hand sewed it to the front. I love the simplicity of the quilt, and the fabrics are really great. Sigh. The Universe was teasing me by putting this on my work calendar as soon as I came home from Tobermory, where I'd been working on my own D.W.R. If you're a quilter, I bet we have a happy problem in common: People bring us fabric. On the one hand, I love it. On the other, I already have too much - if I stuff their offering into my stash, it may never come out! 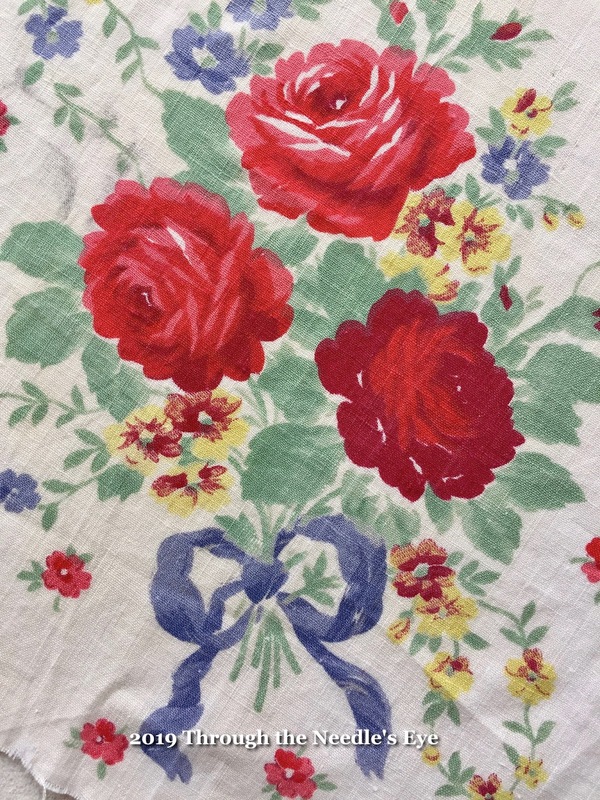 This problem gets even better when people bring me interesting vintage textiles. So here's one solution: Enjoy processing it immediately, then give it right back, in a form they can use. You know how sometimes you find a thing and it needs to come live with you even though you don't know why? This box is one of those things. I found it at an estate sale that had advertised itself as a lifetime collection of craft supplies. Or something like that. It's been a while and I don't remember the exact phrasing, but the ad definitely over-promised. They didn't have much and it was one of those sales where almost nothing is priced.